WWE WrestleMania 35 took place on April 7, 2019, at MetLife Stadium, New Jersey. The grandest event of World Wrestling Entertainment saw the record attendance of 82,265 people. The flagship event of WWE proved to be the best for the good guys of WWE. Becky Lynch, Kofi Kingston and Seth Rollins become new faces for the championship title. Let us find out more results and highlights from the recently concluded mega event of WWE. WWE WrestleMania 35: The Man Becky Lynch Becomes the New RAW and SmackDown Women’s Champion As She Defeats Ronda Rousey and Charlotte Flair. Becky Lynch became the new WWE RAW and SmackDown Champion by defeating Charlotte Flair and Ronda Rousey. While the Ghana-born wrestler Kofi won the match against Daniel Bryan to become the WWE Champion first time ever in his career. Seth Rollins tasted victory against 'The Beast Unleashed' Brock Lesnar to become the WWE Universal Champion. WWE WrestleMania 35: ‘The Animal’ Batista Trips Before His Match Against 'The Game' Triple H (Watch Video). Strowman eliminated The Hardy Boyz after getting distracted by Michael Che and Colin Jost. How sweet it is, @WWERollins! This was indeed Grade A type match, where both the wrestlers put their body on the lines. He entered the ramp in his old days Dr.Thuganomics style. Apart from the above matches, The USOS retained their SmackDown Tag Team Belts by defeating The Bar, Nakamura and Rusev, Ricochet and Aleister Black. The Game defeated Batista in a no holds barred match. Samoa Joe comfortably managed a victory against Rey Mysterio and he is still the WWE United States champion. Finn Balor defeated Bobby Lashley to become the new Intercontinental Champion. 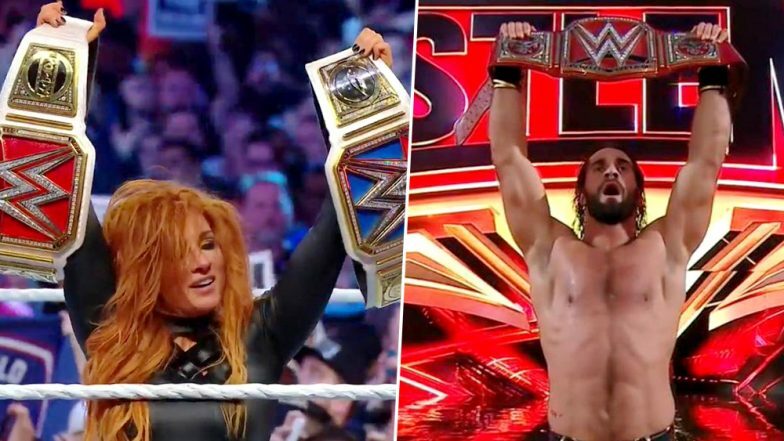 Click here for full WrestleMania 35 highlights. Stay tuned to our website-Latestly for more updates and news from WWE.